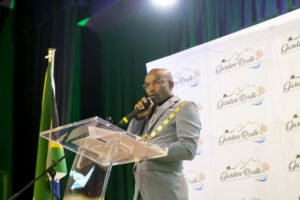 The District Economic Development (DED) Section of the Municipality facilitates constructive interaction between business chambers, local authorities and other key stakeholders that could influence the business environment of the Garden Route. DED promotes and supports collaborative leadership and shared growth within the economic delivery system of the Garden Route economic region. The Unit is expected to act as a channel for communication between stakeholders while managing conflict within the regional business/economic environment. Serving as a vehicle towards developing strategic collaboration and partnerships with key stakeholders across the region, province and country, it also provides a platform for the formulation of solutions to pressing business and economic related issues, problems and challenges. BThe South Cape Economic Partnership (SCEP) has emerged from a collaboration between the Garden Route District Municipality (GRDM), local municipalities and the functional Business Chambers within the Garden Route District. The objective for the composition of SCEP is to facilitate partnerships between Municipalities and other stakeholders, for the effective implementation of catalytic programmes and projects towards regional economic development. Within this context, the partners have agreed on a set of objectives for SCEP through a revised Partnership Charter in 2015. Provide a platform for the formulation of solutions to pressing business related issues, problems and challenges. In relation to the Western Cape Economic Development Partnership, SCEP is administrated (funds, human resources, etc.) by the Western Cape Economic Development Partnership, but operates in and benefits the Garden Route and Klein Karoo region only.